Defending champions Nigeria reached the final of the African Youth Championship in Congo with a 1-0 victory over Gambia. Both sides had men sent off with straight red cards during the game in Brazzaville. Uwa Echiejile proved to be the hero and the villain for Nigeria as he scored the only goal of the game before being dismissed in the second-half. Echiejile's scored the first goal on 19 minutes with a free-kick from just outside the area. The wall was poorly positioned to give Echiejile a clear shot at goal and his softly-taken kick hit the post before bouncing in. The Gambia, who had won all their group games at the tournament, responded well, hitting the crossbar close-range on 30 minutes after some neat passing on the right. However they made things difficult for themselves on 38 minutes when defender Alagie Amadou Ngum was shown the red card after a Nigerian player went down in the box clutching his face. On the hour mark Nigeria were also reduced to 10 men as Echiejile was sent off for a terrible challenge in the middle of the park. 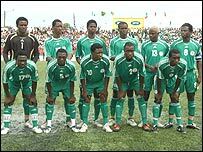 After the game the Nigerian players said they were disappointed with the way they played but happy to be in the final. In Saturday's final Nigeria will now play either hosts Congo or Zambia, who clash in Tuesday's other semi-final in Pointe Noire. Gambia will take on the loser of that game in the 3rd place play-off and all four semi-finalists have qualified for the Fifa World Under-20 Cup in Canada later this year.